Jill Lagasse opened her business in 2017 with a goal to provide exceptional service with outstanding quality. 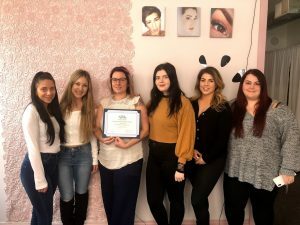 Design Her Eyes Lash Lounge is a full service lash and brow extension salon located in the heart of downtown Haverhill at 62 Wingate Street. Jill is a licensed cosmetologist, promises to be there for you along the entire process, making sure you get the best results. From L to R – Julia Palizzolo, Abigail Alper, Jill Lagasse, Catherine Contarino, April Surette, and Emily Lagasse.